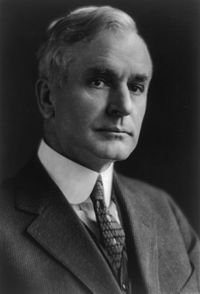 Cordell Hull (October 2, 1871 – July 23, 1955) was an American politician from the U.S. state of Tennessee. He is best-known as the longest-serving Secretary of State, having held the position for 11 years (1933–1944) in the administration of President Franklin Delano Roosevelt. Hull received the Nobel Peace Prize in 1945, for his role in establishing the United Nations, and was referred to by President Roosevelt as the "Father of the United Nations." Hull was born in a log cabin in Olympus, which is now part of Pickett County, Tennessee, but had been incorporated from Overton County, Tennessee. Hull became the elected chairman of the Clay County Democratic Party at the age of 19. In 1891, he graduated from Cumberland School of Law at Cumberland University and was admitted to the bar as a teenager. He served in the Tennessee House of Representatives from 1893 to 1897. During the Spanish-American War, Hull served in Cuba as a captain in the Fourth Regiment of the Tennessee Volunteer Infantry. Hull served 11 terms in the United States House of Representatives (1907–1921 and 1923–1931) and authored the federal income tax laws of 1913 and 1916 and the inheritance tax of 1916. After an electoral defeat in 1920, Hull served as chairman of the Democratic National Committee. He was elected to the Senate in 1930, but resigned upon being named Secretary of State in 1933. In 1933, Hull was appointed Secretary of State by Franklin D. Roosevelt; he served 11 years, until he retired from public office. Hull became the underlying force and architect in the creation of the United Nations, drafting, along with his staff, the United Nations Charter in mid-1943. He resigned as Secretary of State in November 1944, because of failing health. In 1945, Cordell Hull was awarded the Nobel Peace Prize for "co-initiating the United Nations." Hull died after suffering several strokes and heart attacks in 1955, in Washington, D.C., and is buried in the vault of the Chapel of St. Joseph of Arimathea in the Washington National Cathedral, which is an Episcopal church. There is now a Cordell Hull Museum located near his birthplace in Byrdstown, Tennessee, which houses his papers and other memorabilia. Hull was born in Olympus, Pickett County, Tennessee, third of the five sons of William "Uncle Billy" Paschal Hull (1840–1923) and Elizabeth (Riley) Hull (1841–1903), who had married after the Civil War. The first Hull ancestors that had journeyed to Tennessee, Allen B. Hull and his wife Syreana, came from Virginia after being promised land grants from the Continental Congress in reward for their service during the American Revolutionary War. His mother's ancestors had come to Tennessee for the same reason and from the same state. His brothers were named Orestes (1868), Sanadius (1870), Wyoming (1875), and Roy (1881). He attended college from 1889 until 1890. At the age of 19, Hull became the elected chairman of the Clay County Democratic Party. In 1891, he graduated from Cumberland School of Law at Cumberland University and was admitted to the bar. He served in the Tennessee House of Representatives from 1893 to 1897. During the Spanish-American War, Hull served in Cuba as a captain in the Fourth Regiment of the Tennessee Volunteer Infantry. Hull married Rose Frances (Witz) Whitney (1875–1954), a one-time divorcee, in 1917. The couple had no children. Rose was the daughter of Mr. and Mrs. Isaac Witz of Staunton, Virginia. Witz was a banker interested in industrialism. From 1903 to 1907, Hull served as a local judge; later he was elected to the United States House of Representatives, where he served 11 terms (1907–1921 and 1923–1931) totaling 22 years. After his defeat in 1920, he served as chairman of the Democratic National Committee. As a member of the powerful Ways and Means committee, he fought for low tariffs and claimed authorship of the federal income tax laws of 1913 and 1916 and the inheritance tax of 1916. Hull was influential in advising Albert Gore, Sr., then a state legislator, to run for the U.S. Congress in 1938. Hull was elected to the Senate in 1930. In 1933, Roosevelt named him Secretary of State. Hull strove to enlarge foreign trade and lower tariffs. In 1943, Hull served as United States delegate to the Moscow Conference. Hull was the Secretary of State responsible for foreign relations before and during the attack on Pearl Harbor. He sent the Hull note to Japan prior to the attack, which was formally titled "Outline of proposed Basis for Agreement Between The United States and Japan" but had been part of the United States' attempt to open Chinese markets to U.S. goods, against Japanese interests there. Roosevelt advised him not to tell them about the raid but to receive them formally and coolly bow them out. After he had glanced at their copy of the fourteen-part message [Japan's declaration that negotiations were at an end], Hull's anger burst forth. "In all my fifty years of public service," he told the astonished diplomats, "I have never seen such a document that was more crowded with infamous falsehood and distortion." Nomura and Kurusu, who had not been told of the attack, bowed themselves out in an embarrassed fluster. A department official overheard Hull muttering under his breath as the door closed, "Scoundrels and piss-ants." Hull chaired the Advisory Committee of Postwar Foreign Policy, created in February 1942. 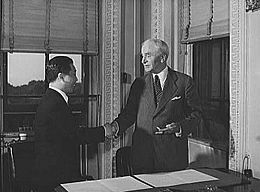 Hull and Chinese Ambassador Wey Daw-ming at the State Department exchanging ratifications of the treaty abolishing extra-territorial "rights" of the United States in China. When the Free French Forces of Charles de Gaulle liberated the islands of Saint-Pierre and Miquelon (located south of Newfoundland) in December 1941, Hull lodged a very strong protest and even went as far as referring to the Gaullist naval forces as "the so called Free French." His request to have the Vichy governor reinstated was met with strong criticism in the American press. The islands remained under the Free French movement until the end of World War II. There is some controversy over Hull's role in the 1939 SS ''St. Louis'' affair, where Jewish refugees were denied entry into the U.S. These Jews fled Europe to escape from the Nazis and after being denied entry into Cuba and the U.S. were returned to Europe where most became victims of the Holocaust, after the Nazis invaded Western Europe in the following years. In September 1940, First Lady Eleanor Roosevelt maneuvered with another State Department official to bypass Hull's refusal to allow Jewish refugees aboard a Portuguese ship, the Quanza, to receive visas to enter the U.S. Through Mrs. Roosevelt's efforts, the Jewish refugees disembarked on September 11, 1940, in Virginia. Hull was the underlying force and architect in the creation of the United Nations, as recognized by the 1945 Nobel Prize for Peace, an honor for which Franklin D. Roosevelt nominated him. During World War II, Hull and Roosevelt spent tireless hours working toward the development of a world organization to prevent a third World War. Hull and his staff drafted the "Charter of the United Nations" in mid-1943. Never one to sit idly by if American interests were (in his view) threatened, Hull would think nothing of dressing down close allies, such as what happened to New Zealand Prime Minister Peter Fraser in early 1944, over U.S. objections to the Canberra Pact (a military treaty of alliance between Australia and New Zealand made in February 1944 without U.S. consultation). Hull resigned as Secretary of State in November 1944, because of failing health. Roosevelt described Hull, upon his departure as "the one person in all the world who has done his most to make this great plan for peace (the United Nations) an effective fact." The Norwegian Nobel Committee honored Hull with the Nobel Peace Prize in 1945, in recognition of his efforts for peace and understanding in the Western Hemisphere, his trade agreements, and his work to establish the United Nations. Hull was the longest-serving Secretary of State. He remained in office for 11 years, nine months. Hull died in Washington, D.C., and is buried in the vault of the Chapel of St. Joseph of Arimathea in the Washington Cathedral. In the Worldwar series of alternate history novels by Harry Turtledove, Hull becomes president at some point in 1944, following the deaths of first Vice-President Wallace and then President Roosevelt. Hull was portrayed by veteran actor George Macready in the 1970 film Tora! Tora! Tora!. Actor Charles Trowbridge played Hull in the 1941 film, Sergeant York. Hull worked hard for his country and for the international community. He was highly dedicated to promoting democracy at all costs. He is remembered for his dedication to extending the reaches of democracy. He was highly productive in his national role and was known as a man of integrity. His memory is preserved by Cordell Hull Dam on the Cumberland River near Carthage, Tennessee. His law school, Cumberland School of Law, continues to honor Cordell Hull with a Cordell Hull Speaker's Forum and the pictured Moot Court Room. A segment of Kentucky highway routes 90, 63, and 163, from Interstate 65 at Mammoth Cave National Park south to the Tennessee State Line, is named "Cordell Hull Highway." The Shoreline School District in Shoreline, Washington, had a Cordell Hull Middle School, which was renamed in the mid-1990s to Meridian Park Elementary, after a renovation. There is a Cordell Hull Lake, covering approximately 12,000 acres (49 km²), in the vicinity of Nashville. ↑ Harold B. Hinton, Cordel Hull: A Biography (Garden City, NY: Doubleday, Doran & Co., Inc., 1942), 22. ↑ Edwin T. Layton, Roger Pineau, and John Costello, And I Was There: Pearl Harbor and Midway—Breaking the Secrets (New York: William Morrow & Co., 1985), 314. ↑ U.S. Coast Guard, The Voyage of the Damned. Retrieved October 31, 2007. ↑ Cara Buckley, Fleeing Hitler and Meeting a Reluctant Miss Liberty. Retrieved October 31, 2007. Biographical Directory of the United States Congress. Hull, Cordell. Retrieved October 31, 2007. Buckley, Cara. New York Times. July 8, 2007. Fleeing Hitler and Meeting a Reluctant Miss Liberty. Retrieved October 31, 2007. Hull, Cordell. The Memoirs of Cordell Hull. New York: Macmillan, 1948. Pratt, Julius W. Cordell Hull, 1933–44. New York: Cooper Square, 1964. University of Tennessee. The Papers of Cordell Hull Retrieved October 31, 2007. U.S. Coast Guard. The Voyage of the Damned. Retrieved October 31, 2007. All links retrieved March 23, 2017. The Cordell Hull Foundation, a non-profit NGO, based around furthering international peace and co-operation. The Cordell Hull Institute, a U.S. think-tank focusing on furthering debate in international economic development and trade. This page was last modified on 23 March 2017, at 14:52.